Necrobumping a 1 year, 4 months, and 12 days old thread. Yay! Initially, I was considering to depict a physical fight between two characters but scrapped it for unoriginality. Instead, I settled with the "inner battle", more precisely the fight with the inner demons. Yeah, that's about it. I honestly never attempted to create an animation and figured it would be a nice change. 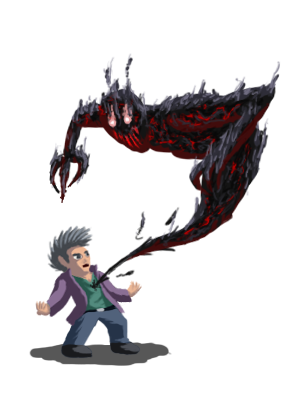 The theme itself gave me quite a headache because I totally wanted to sprite Charybdis, Leviathan, or Yggdrasil. All of them are fairly difficult to sprite in a somewhat proper LF2-world, so in the end, I settled with the Hydra. Of course, the key element of it are the extra-heads that appear upon beheading which pretty much settled what the animation is all about. As for the other character, Heracles would've been more fitting but I was running short on time so respriting an existing character would be the fastest. I intentionally say "respriting" because it's a) double the original res and b) the light source is on the other side. To spread some confusion about the authorship, I refrained from using my trusty brush tool and instead used the pencil tool. 180% pain. 1 year, 6 months, 22 days! I find the concept to be too flamboyant, except for the middle one. But great skill regardless! PS: I find the "get more" function in the Smilies box in Quick Reply to not be working. Is it because I'm not using the "www" bit at the url? Just checked - yes it is. Current time: 04-24-2019, 04:18 AM Powered By MyBB, © 2002-2019 MyBB Group. Theme created by Silverthorn.